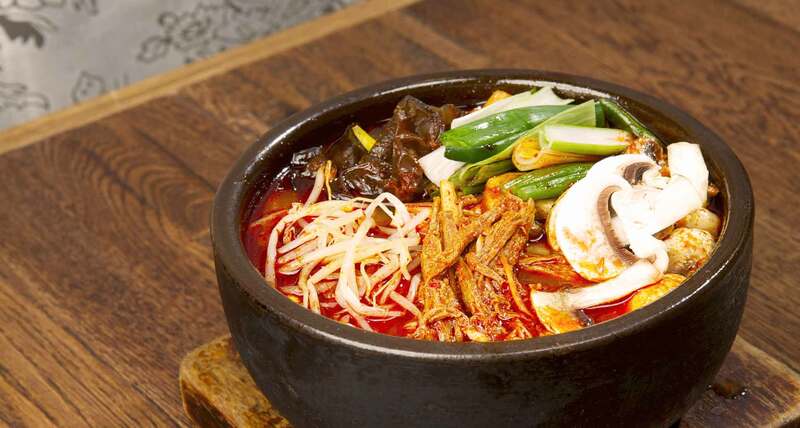 Yukgae-jang is a spicy, soup-like Korean dish made from shredded beef with scallions and other vegetables, which are simmered together for a long time. Formerly served in Korean royal court cuisine, Yukgae-jang is believed to be healthful and is popular due to its nutrient value and spicy nature. Yukgae-jang is one of the dishes many Koreans eat to regain stamina during the summer. But it’s also great for any season of the year, especially when the day is chilly. In addition to shredded beef and scallions, Yukgae-jang includes bean scallions, sprouts, mushroom, bracken fern, taro stems, sliced onion, sweet potato noodles, chili powder, garlic, sesame seeds, soy sauce, chili oil, and black pepper. Yukgae-jang is a soup that can be thoroughly enjoyed with a bowl of steamed rice. This delicious dish is for you, especially if you’re getting over a pesky cold or need a good hangover cure. SURA Korean Cuisine Restaurant takes pride in using only the freshest & the finest ingredients available to serve our outstanding customers with this mouthwatering Yukgae-jang. Visit us today with your loved ones to try out this delight in this dish.